Here are a few of the peppers I grew this season. I'm so happy to get some ripe on the vine! At this point in the season though, I'm pulling them before they are totally ripe to let them finish inside. That way more will ripen before the dreaded frost comes! Pictured are; Jimmy Nardello - the long red one, (they are the best - super sweet!) 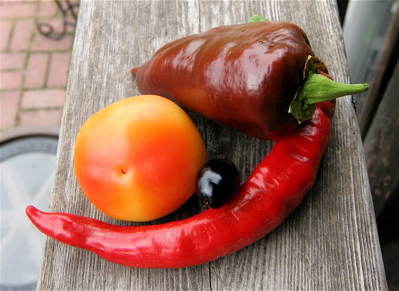 Alma Paprika - the little reddish orange one, Peruvian Purple Chile - little purple one (they are hottt! ), and Sweet Chocolate - reddish brown one (they don't taste like chocolate). 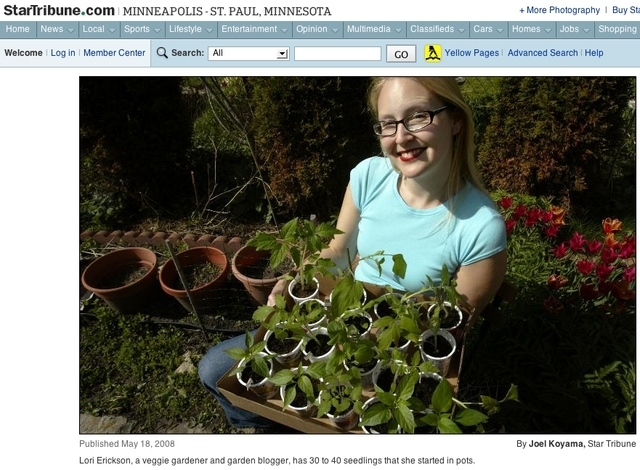 I will grow all of these again next year. Especially the Jimmys - they are so good! This is a Thai Dragon Pepper that has been living on my kitchen window sill since it broke off last summer and I re-rooted it in this pot. It has had several blooming and friuting cycles as well. I have been pollinating it myself. In the summer it bloomed and fruited pretty much with the rest outside, but during the fall and winter it seems to be confused and blooms every 2 months or so. Sure wish I'd been keeping track of the cycles. It's been way more than what you'd expect. 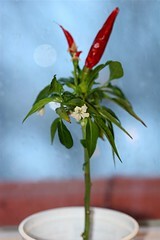 Actually, I wouldn't expect any flowering or anything from a hot pepper in a winter window.